Definitive, packet-level evidence at your fingertips. Faced with the need to diagnose and fix security and performance issues on large-scale, high-speed networks, organizations need data sources that go beyond log files and metadata. The EndaceProbe™ Analytics Platform provides full packet capture and recording, with zero packet loss, on network links from 10Mbps to 100Gbps, allowing organizations to capture, index and store a 100% accurate record of network activity. EndaceProbes are the industry's only, truly, open packet capture platform, allowing both hosting of, and integration with, commercial, open-source and custom analytics applications. Accelerate response times and reduce costs by hosting and integrating with analytics solutions from Cisco, Palo Alto Networks, Dynatrace, Splunk and Plixer, and custom or open-source tools such as SNORT, Bro IDS, Suricata, Argus or Nagios. Hosted applications can access live network traffic at line rate, or use Playback™ to analyze recorded Network History. Find out more about the benefits of our Open Platform approach. We are pleased to announce the launch of our new, ultra-high-density 9200 Series EndaceProbes. 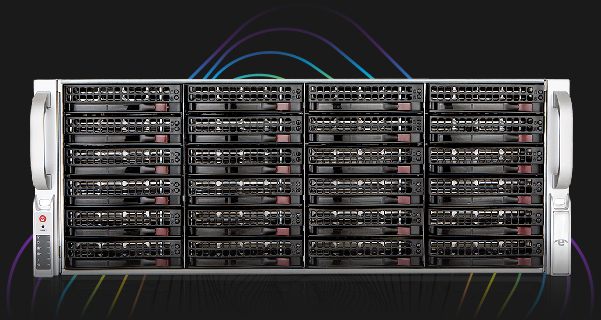 Delivering up to a Petabyte of effective packet storage, the new EndaceProbe™ 9200 Series uses built-in Compression and patent-pending Smart Truncation™ on top of 432Tb of fully RAID-protected raw storage. All in a single, 4RU appliance that can record at a sustained 40Gbps. 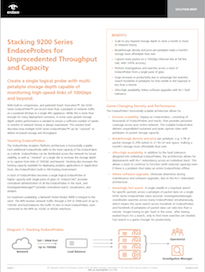 Find out how stacking works in this 9200 Stacking Solution Brief. The EndaceProbe Analytics Platform can solve a range of visibility problems and be deployed in a number of scenarios. See how you can deploy the EndaceProbe to redefine network visibility. The EndaceProbe vProbe is a virtual machine implementation of the EndaceProbe Analytics Platform designed to record crucial network history in virtual and cloud environments and provide visibility into virtual network traffic, including East-West traffic. It integrates seamlessly into an EndaceFabric and provides the same centralized search and management as physical EndaceProbes. Endace's open platform approach to security and network analytics gives NetOps and SecOps teams the flexibility to deploy third party analytics and security software when and where it's needed. We call this Endace Fusion. Continuous, 100% accurate, line-rate recording of network traffic, any speed, any network. Dedicated packet capture hardware ensures lossless capture with nanosecond accurate timestamping. Playback Network History on-demand to hosted or external analytics tools for back-in-time analysis. Built-in EndaceVision™ and EndacePackets™ investigation tools for fast, accurate issue investigation. Provenance™ augments recorded Network History with rich contextual data. APIs provide integration with commercial, open source and custom analytics applications for streamlined issue investigation. Host third-party analytics applications and give them access to both real-time and recorded traffic for analysis. EndaceProbes are available in a range of models to suit every deployment requirement. 3 Write-to-disk performance is influenced by the number of flows-per-second. Actual performance could be as much as 30% higher than the stated figure.